At some time in their life nearly every girl, boy (and adult) has thrown pebbles or cobbles into mud and watched nice round form. 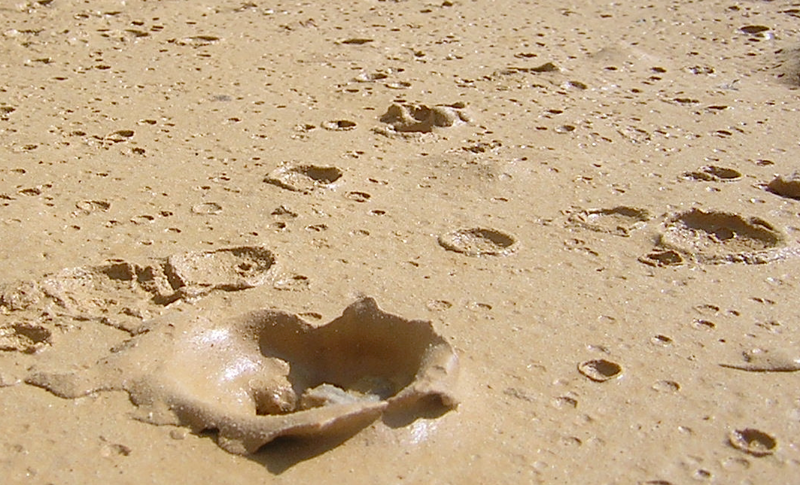 The force of the impacts create circular structures with raised rimmed wall; spatters of mud and smaller circular secondary craters may be seen (Fig. 1). 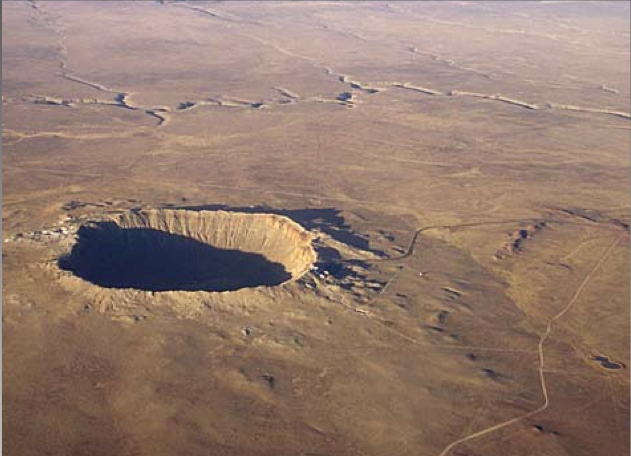 When first we see images of the famous one-kilometer (0.75-mile) bowl-shaped Barringer meteorite crater in Arizona (Fig. 2) we may think it somehow formed from an identical mechanism. Fig. 1. Pebble-induced mud craters. Fig. 2. The Barringer Meteorite Crater. 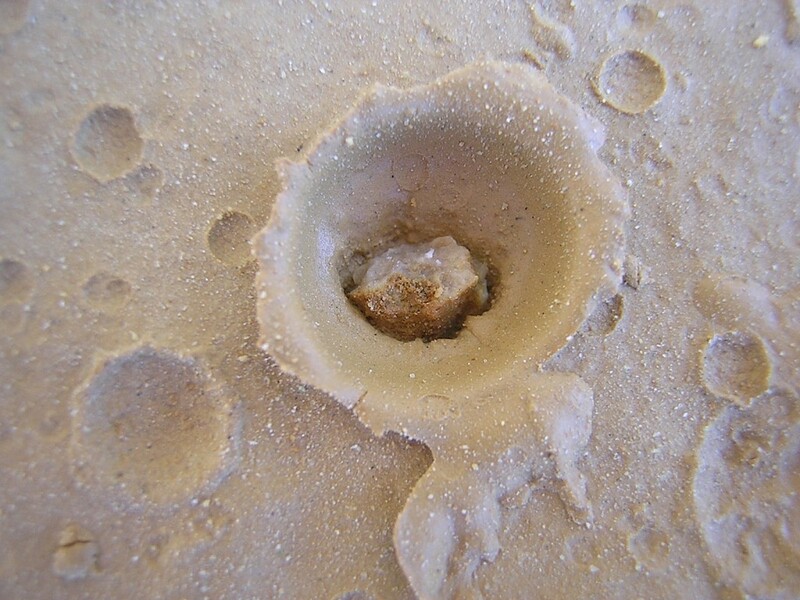 Hailstones and even raindrops may produce on harder ground small craters as well (Fig. 3), and the central mound in the craters shown in Fig. 3 strongly resemble meteorite impact craters exhibiting a central uplift like the Tycho impact crater on Earth’s moon (Fig. 4). And again, one might suspect a process similar to rock tossed into mud. Fig. 3. Hailstone craters. 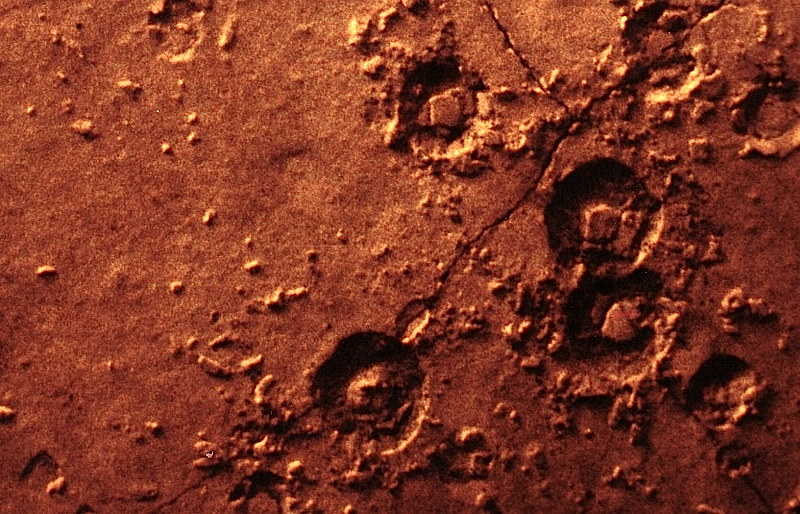 The diameter of the each miniature craters is 5 – 10 mm. – The curious central mound within the craters can be explained by Hertzian and spallation fracturing on collision with the hard hailstones. A comparable process is observed with the peculiar shock-deformed Buntsandstein conglomerates in Spain and is in more detail explained HERE. Fig. 4. 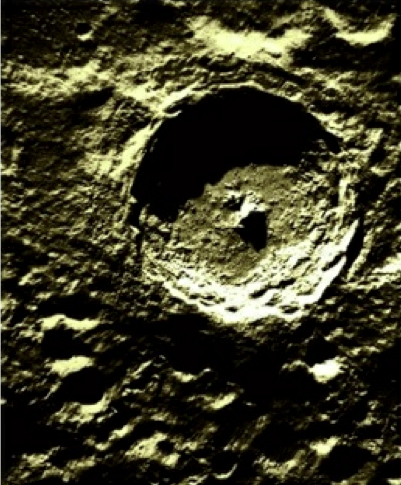 Tycho meteorite crater on the Moon. Tycho’s diameter is 85 km. 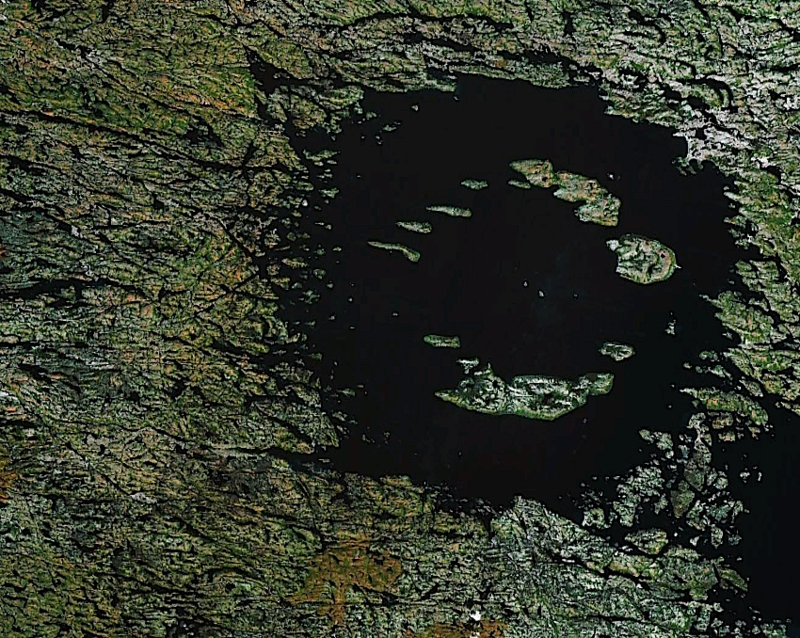 HOWEVER: METEORITE CRATERS DO NOT FORM LIKE THIS. Fig. 5. Not a model for impact crater formation. Before focusing on this important question, we have first to clarify the meaning of the term meteorite impact crater or impact structure. It is true meteorites crashing as stones from the sky at free-fall velocity may in fact produce small craters in the ground similar to mud and hailstone craters. These craters are, however, decidedly not impact structures. Impact structures are formed by a cosmic body travelling at a velocity exceeding that of sound commonly around 5 km/s impacting target rocks leading to the sudden intense spreading of shock waves. These conditions only occur with larger projectiles (a few hundred tons and more) that are not significantly slowed down by friction in the atmosphere that impact the ground at cosmic velocities (10 – 70 km/s). The term impact structure is often used synonymous with impact crater. Sometimes, impact structures are distinguished from impact craters by their weak morphological signature compared with a true crater. In either case, the conditions of a hypervelocity impact and propagation of shock waves are crucial for the formation of these geologically extraordinary structures. In the following, these three stages are illustrated and described in a somewhat simplified manner. Fig. 6. The contact and compression stage of impact cratering. 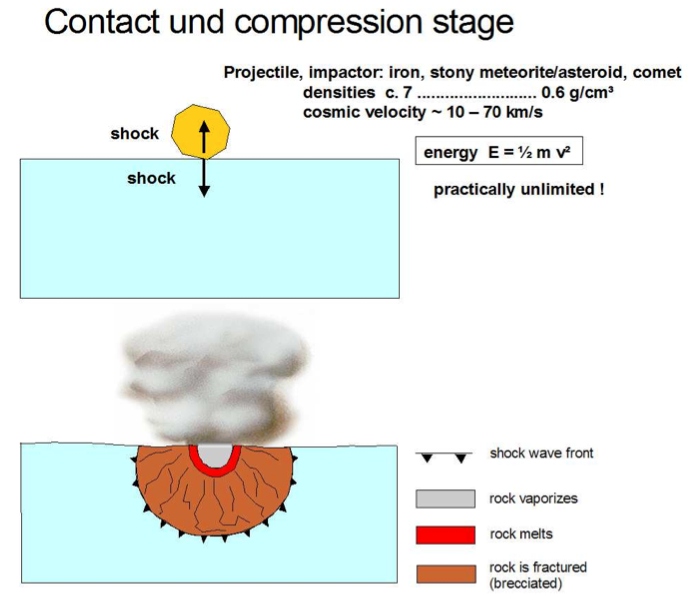 On impact of a cosmic body, shock waves start from the contact point and propagate into both the underground target rocks and into the impactor. 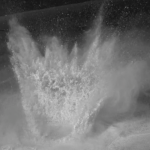 Impact shock waves are characterized by an instantaneous onset of extreme pressures (up to the order of megabars) and extreme temperatures (up to 10,000 degrees or more) on release of the pressure. These temperatures are enough to more or less completely vaporize the impactor and a volume of the target rocks roughly comparable to the volume of the impactor, resulting in a giant expanding impact vapor plume. On propagating roughly hemispherically into the underground target rocks, shock wave energy diminishes and so does pressure and temperature. Correspondingly, a zone of rock melt follows the vaporized zone, and when shock energy is further lowered rocks will only be heavily damaged (fractured, brecciated) with decreasing intensity. Driven by the hypervelocity impact deformation, melted and fractured rocks will be accelerated behind the shock front initiating – in the second stage – the excavation mass flow. Impactors can be practically any size; the (kinetic) energy brought to Earth by impact may exceed that equivalent to thousands of hydrogen bombs detonating at once. This is clearly different from “normal”, endogenetic geological processes such as volcanism, earthquakes, tsunamis or other tectonic events. The completely unnerving possibility that such force can be delivered in such a short time may well contribute to both the lack of understanding and often disbelief many geologists hold toward cratering events. Fig. 7. 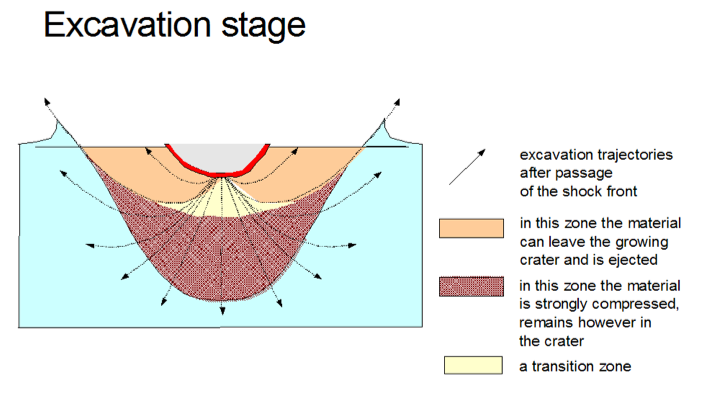 The excavation stage of impact cratering. Unlike the rock-into-mud cratering, the excavation in impact cratering is inextricably linked with the propagation of shock waves. Shock waves behave like other waves: they can interfere and they may be reflected and refracted. Spreading outwards from the point of contact, compressive shock waves are permanently reflected from the free target surface as tensile rarefaction waves of comparable intensities and, like the shock waves, are propagated downwards. In this way, all rock particles behind the expanding shock front are “captured” by both the compressive shock and the tensile rarefaction, and both combine into a vector of acceleration. Computing these vectors (direction and magnitude) for each point in the subsurface, a field of excavation flow with arcuate trajectories as shown in the sketch above (Fig. 7) will result. This flow field grows with time, and the rock mass flow is directed upwards, sideward and downwards. In the upper part, the flow field enables the rock masses to escape as ejecta from the growing excavation cavity. Below a trajectory defining floor and walls of the expanding cavity, the rock material cannot leave and is compressed sideward and downwards. The excavation stage ends on release from shock and when the displacements by excavation cavity formation and downwards/sideward compression reach an end. 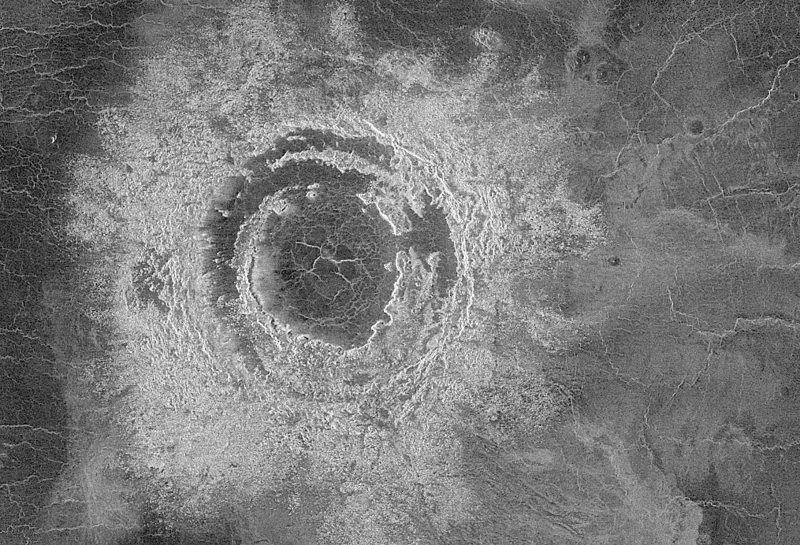 The now existing bowl-shaped structure surrounded by an uplifted rim and a blanket of ejected material is termed the transient crater obviously indicating a continuation of the impact cratering process arriving in the modification stage. We see that shock wave and rarefaction wave propagation are essential in the formation of a meteorite impact crater. Apart from the distinct role rarefactions waves play in the formation of the excavation flow field, they are especially relevant geologically. A compressive shock pulse is not only reflected at the free target surface but also always when it impinges on a boundary of material with reduced impedance (equivalent to the product of density and sound velocity) where part of the energy is reflected as a rarefaction pulse. The reflected tensile stresses are insofar crucial as the tensile strength of rocks is much lower than the compressive strength. Hence in an impact process much more damage is in general done by the rarefaction waves and not by the compressive shock waves, and many peculiar structural features that are observed in impact structures and that may appear puzzling to geologists are the result of strong tensile forces acting on all scales (for more information see the term spallation in the SEARCH function of our website). Fig. 8. 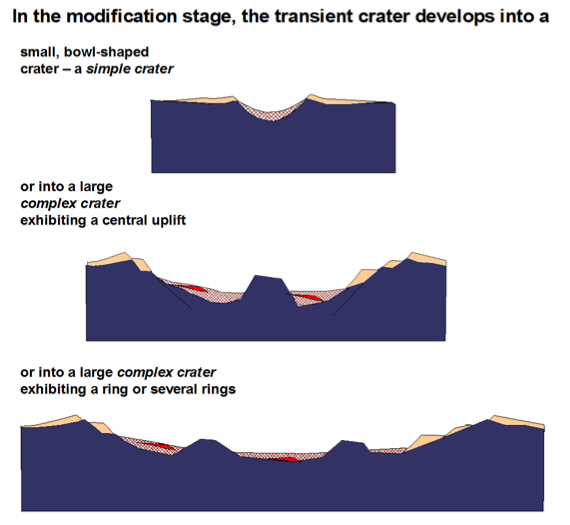 The modification stage of impact cratering. The term “transient crater” means the cratering process continues after the excavation flow comes to rest. What happens to the transient crater? This depends on how large the crater is. In the case of small transient craters, modifications are moderate. On relieving of pressure, there is an elastic rebound at the crater floor now hosting a layer of brecciated rocks. The structure of the transient crater is widely preserved, and we are left with a simple or bowl-shaped impact crater (Fig. 9). For larger transient craters the modifications may take on a dramatic scale. 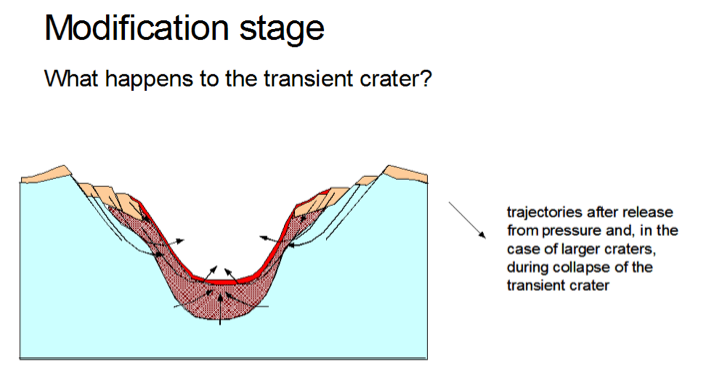 Elastic rebound and collapse cause the excavation trajectories to go into reverse in a way, and the rock masses tend to move upwards and centripetally thus, accompanied by large-scale downfaulting, largely backfilling the transient crater. This will result in the formation of central uplifts and ring systems, and we may now refer to these as central-uplift or central-peak craters, peak-ring craters or multi-ring craters establishing the group of so-called complex impact craters or complex impact structures (Fig. 9). The transition from simple to complex craters occurs at about 1.5 to 4 km (depending on the target rocks) final diameter for terrestrial craters and is much larger (c. 15 km) for craters on the Moon. This suggests that the transient crater collapse in the modification stage is largely driven by gravity (gMoon ~ 1/6 gEarth). For very large impact craters, the excavation and modification stages are not as discrete as previously written. 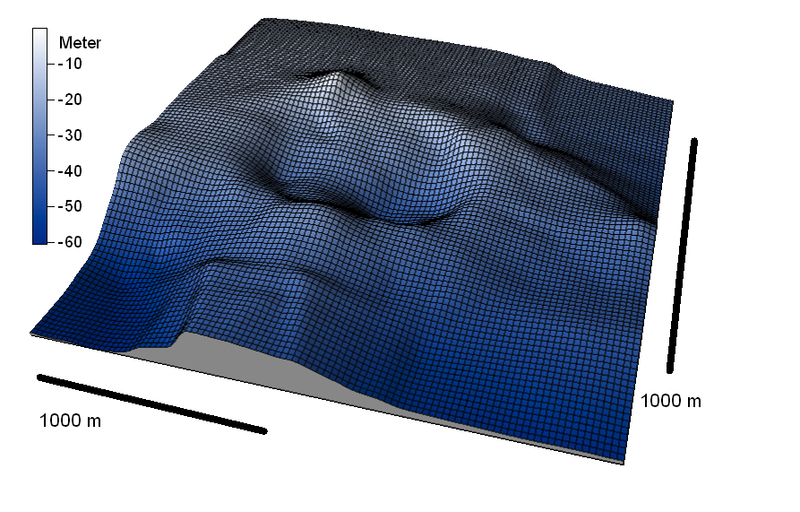 Computer simulations show that the modification process may already begin before standstill of the excavation leading to large-scale countermovement of rock masses. In the large 35-40 km-diameter Azuara, Spain impact structure there is stratigraphic evidence for such a nearly simultaneous excavation and collapse [click here]. Fig. 9. Cross sections of simple and complex impact craters. Figs. 10 – 12 exemplify typical terrestrial structures. Generally speaking, large impact craters appear to be morphologically flat structures although the impact signature – rock deformations, shock metamorphism – may extend to considerable depths. They are typically filled with impact rocks (impactites) in the form of impact melt rocks, suevites and different kinds of breccias. Fig. 10. 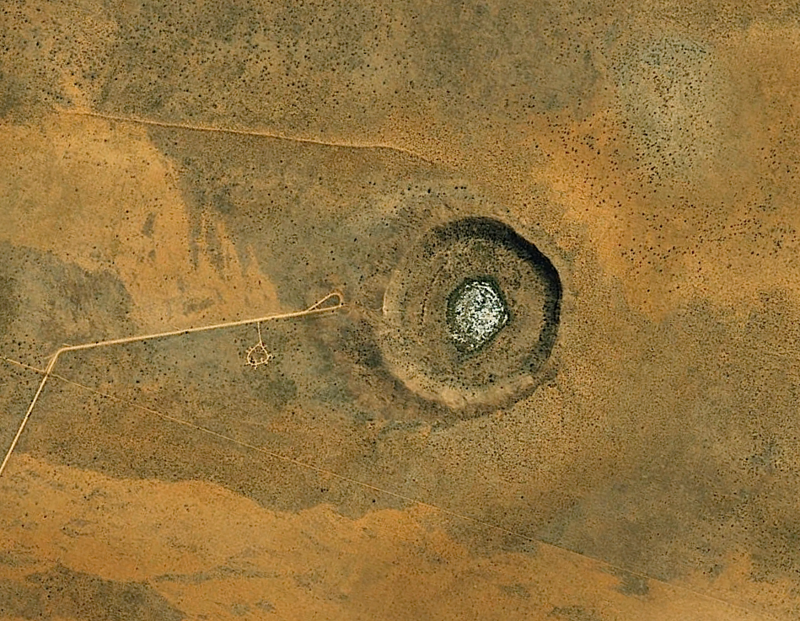 A bowl-shaped simple crater (Wolfe Creek, Australia, 900 m diameter). Google Earth image. Fig. 11. 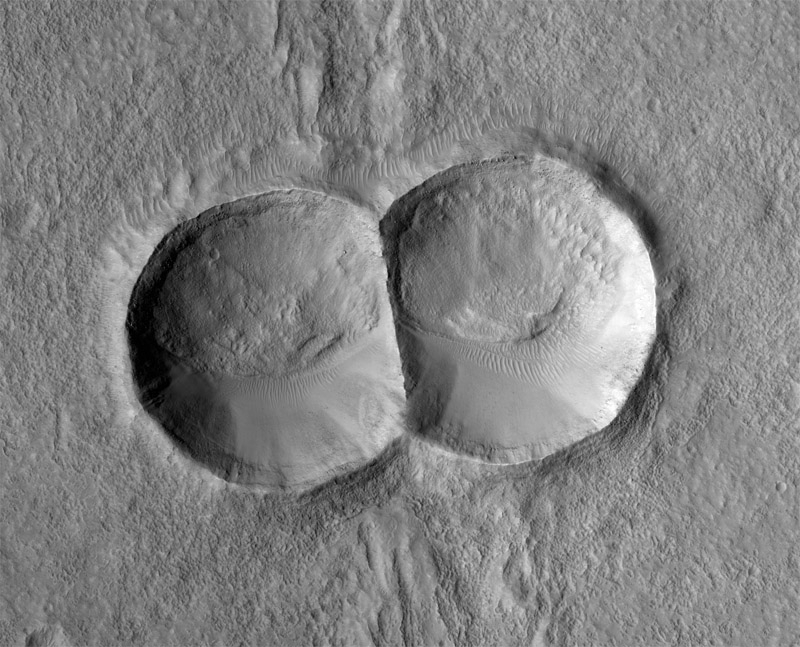 Dual meteorite craters on Mars formed by the synchronous impact of a twin projectile. 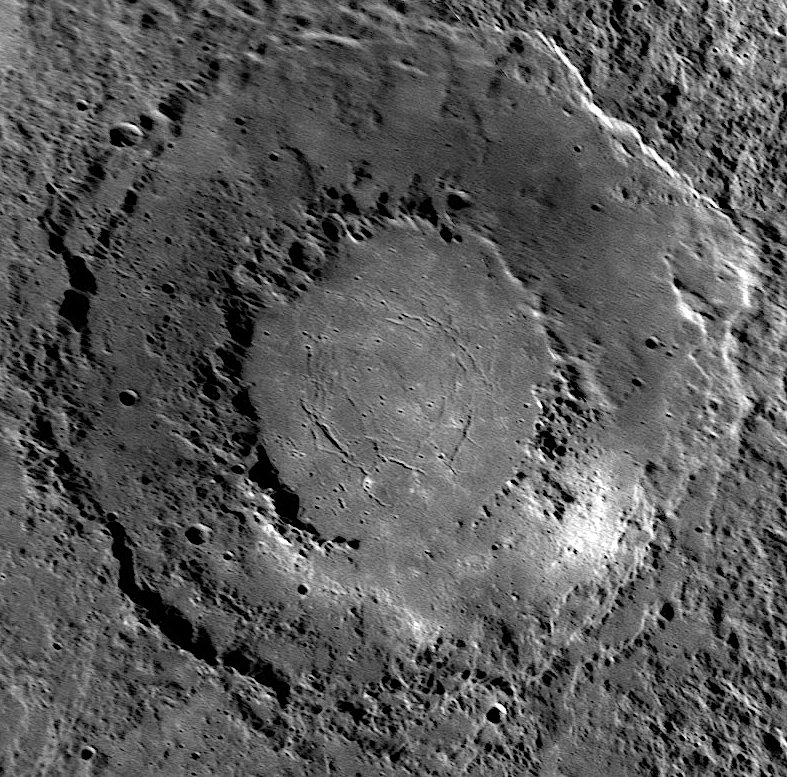 Typically bowl-shaped craters. Image credit: NASA. Fig. 12. Dual crater at the bottom of Lake Chiemsee, Bavaria (Germany) that very probably formed in the large Holocene Chiemgau impact event. There is no other reasonable explanation for the occurrence of such a peculiar structure at the bottom of the glacial Lake Chiemsee. The two projectile produced a pair of rimmed simple, bowl-shaped craters quite similar to the dual craters from Fig. 11. The somewhat blurred contours are not surprising given the impact happened into water and a soft, water-saturated target rock. – Topography from echo sounder measurements. The meter scale indicates water depth. – More about the doublet crater. Fig. 13. 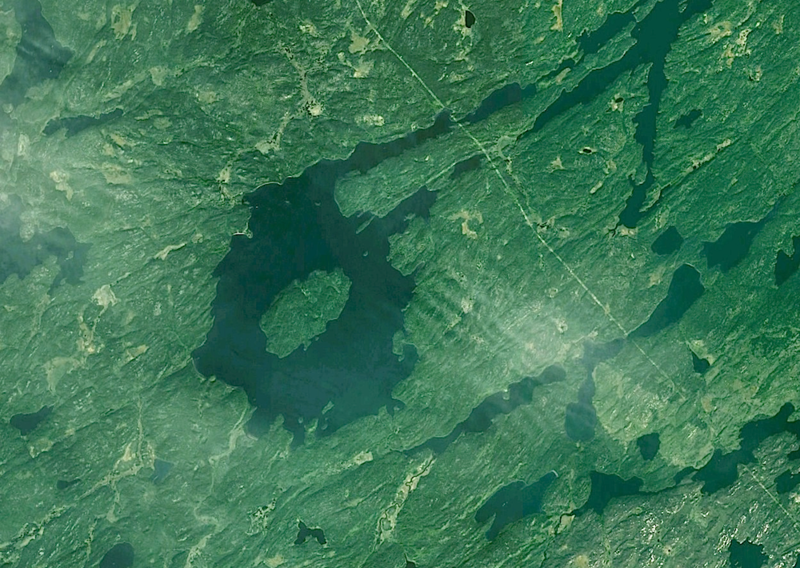 A central-uplift (central peak) crater (Gow, Canada, 4 km diameter). Source: Google Earth. Fig. 14. 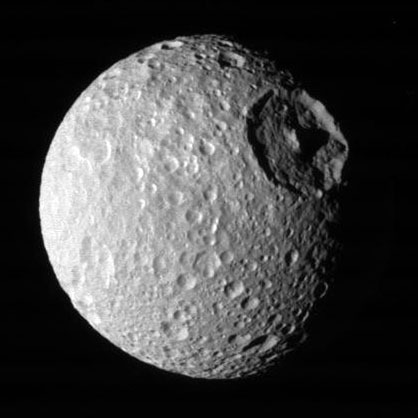 Large (139 km-diameter) Central-peak crater Herschel on the multiple impact Saturnian moon Mimas. Image credit: NASA. Fig. 15. A peak ring crater (Clearwater West, Canada, 32 km diameter). Image: Google Earth. Fig. 16. Peak ring crater Rachmaninoff on Mercury. Diameter 290 km. Image credit: NASA. Fig. 17. Multi-ring basin Mona Lisa on Venus. (80 km diameter). Image credit: NASA. Quite a few interesting questions may remain open. How big, e.g. must an impactor be to produce a given size impact structure? This of course is primarily a matter of energy related with the projectile’s mass (and therefore density) and impact velocity, and, subordinately, also a matter of the target lithology. A very rough rule of thumb amounts to the order of a one-to-ten diameter ratio. Here again, the difference is obvious: In the case of cobble-into-mud or raindrop “impacts” the craters are not much larger than the projectile (Fig. 13). Fig. 18. A stone-into-mud crater demonstrates the difference between it and a hypervelocity crater (Fig. 14): The crater is not much larger than the projectile. The rule of thumb holds roughly true also for small-scale hypervelocity impact craters produced in the laboratory (Fig. 19). Fig. 19. A projectile (like the small plastic sphere) produced the crater in a laboratory hypervelocity impact experiment. The impact velocity was 1250 m/s, and the target (flour) sound /seismic velocity is estimated to have been about 100 m/s. Note the remarkable difference to the crater-projectile ratio in Fig. 18. More about these experiments can be read on the Chiemgau impact website where a hypervelocity impact video may be downloaded. So far we have considered the impact of a solid object like a stony or iron meteorite. What happens if a comet or a very low-density, loosely bound asteroid (like Mathilde asteroid, Fig. 13) hits the earth? For the roughly 200 established terrestrial impact structures neither a comet nor a rubble pile asteroid could definitely be shown to have been the impactor. Computations suggest craters that were formed by a low-density projectile are flatter and have distinctly larger diameter ratios (compared to the above-mentioned one-to-ten ratio of projectile and crater diameter). Fig. 20. 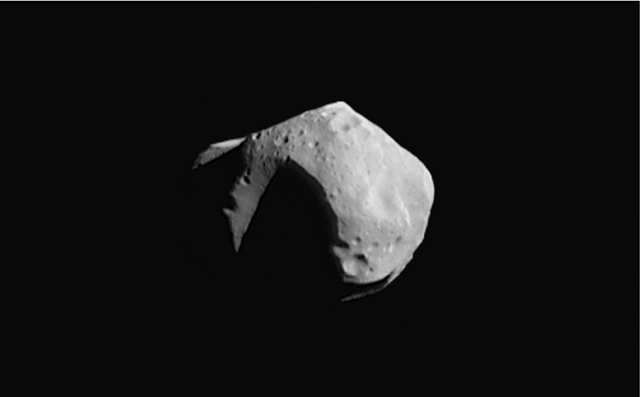 The 50 km-diameter Mathilde asteroid has a mean density of 1.3 g/cm³ only and is considered a kind of rubble pile. What would happen if a loosely bound impactor such s this were to strike Earth? Image source: NASA. How looks an impact crater that was produced by an oblique impact? Statistically, impact trajectories most abundantly form an oblique 45° angle with the target surface. Nevertheless, the resulting impact crater is more or less circular unless the angle of incidence is very low, less than 10°. Then, elongated craters may be formed, and the ejecta blanket may considerably deviate from a circular symmetry. In the beginning debate about meteorite craters (about one hundred years ago), astronomers believed the many craters on the Moon were volcanic. They concluded this from the already mentioned prevailing frequency of oblique impact trajectories leading in the majority, in their opinion, to craters of elliptical shape. This was obviously not the case, and so most of the Moon craters could not be meteoritic. At that time, however, the physics of impact cratering implying shock physics was not yet understood. This especially concerned also the vaporization of the impactor by shock-induced temperatures and, at that time, let the mining engineers helpless when they did not encounter the expected 50 m-diameter iron meteorite beneath the floor of the Barringer (Meteorite) crater. 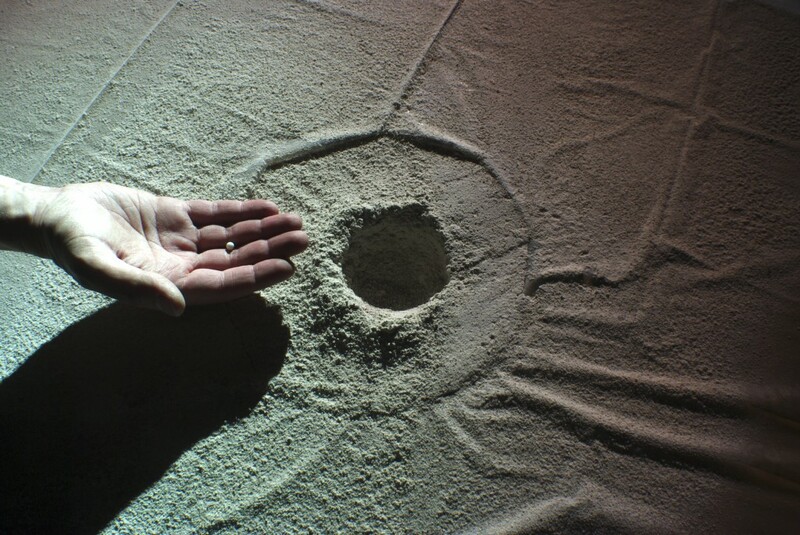 Kathleen Mark: Meteorite Craters. How scientists solved the riddle of these mysterious landforms. 288 pp, The University of Arizona Press, Tucson, 1986. Melosh, H.J. : Impact cratering. A geologic process. 245 pp, Oxford Univ. Press, Oxford, 1989.